Racing Competitively Since: 1984 (Yes I am old!). After college I had a string of injuries and took a 5 year break. I have stayed pretty competitive over the last 10 years and now race as a master, but it definitely gets harder to keep the body healthy as you age! I also have coached high school and junior college cross country and track the last 10 years. Favorite Races: I like doing mile races on the track or the road. Encinitas mile, Summer track series. Favorite Workout: Quarter mile repeats. Words to Live By: Don't sweat the small stuff... life is way too short. 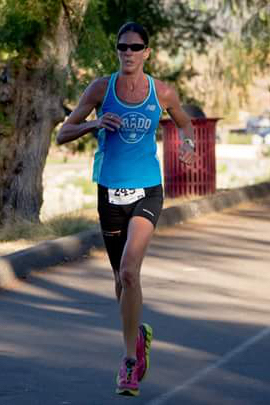 Why I Choose to Run for PRT: I am excited to join the first masters team. These young gals will keep me going strong! What I Like to Do Besides Running: Swim, ski, hang out with my two daughters, and travel.